Yesterday, April 25, Italians celebrated the Festa della Liberazione aka Italy’s Liberation Day. The national holiday commemorates the fall of fascism and end of Mussolini’s rule. The date is also known as the Anniversary of the Resistance, marking the end of the Nazi occupation of the country during World War II. On April 25, 1945, the Allied troops liberated Italy from the Nazi occupation and Benito Mussolini’s rule. Mussolini was an Italian dictator who led the National Fascist Party from 1922 to 1943. He then ruled the Italian Social Republic in parts of Italy that were not occupied by Allied forces from 1943 to 1945. After the Allies liberated the country from Nazi rule, the National Liberation Committee of Upper Italy (CLNAI) officially proclaimed their insurgency in a nationally broadcast radio announcement. On April 25, 1945, the CLNAI proclaimed their seizure of power from Mussolini, who had led the National Fascist Party since 1922. In addition to declaring the siege of power, the CLNAI proclaimed the death sentence for all fascist leaders, including Mussolini, who was caught on Lake Como shot three days, and taken to Milano to then hang. In fact when you are traveling to Lake Como the site is commemorated by a black cross and his dates. The announcement started a ripple effect, sparking resistance efforts in cities throughout the country. By May 1, all of northern Italy was liberated, including Bologna (liberated on April 21), Genoa (on April 23), Milan and Turin (on April 25), and Venice (on April 28). The historical significance was colossal; the liberation put an end to twenty years of fascist dictatorship and five years of war. After the victory of the resistance movement, it wasn’t until the following year that the day became an official national holiday. On April 22, 1946, a bill was written declaring "In celebration of the total liberation of the Italian territory, April 25, 1946 is declared a national holiday". The newly established holiday was commemorated in most Italian cities, with parades, marches, and local celebrations. Similar to the U.S.’s Veterans Day, Festa Festa della Liberazione honors those soldiers who fought against the Nazis and Mussolini’s troops during World War II. The holiday memorializes those who served in the Italian Resistance, hence it is also known as the “anniversario della Resistenza,” or anniversary of the Resistance. Every year on this day, towns and cities throughout Italy celebrate with marching bands, music concerts, food festivals, political rallies, and other public gatherings. Government offices, schools, banks, and most private businesses are closed. As one may expect, the Italian flag is the symbol of the holiday. In addition, the song ‘Bella Ciao’ is often played during holiday celebrations, as it was sung by the Italian resistance during World War II. For those of us not lucky enough to be in Italy right now, raise a glass to the Liberation of our favorite country! Pictured above: Giuseppe Garibaldi, one of the “founding fathers” of the Italian Republic. 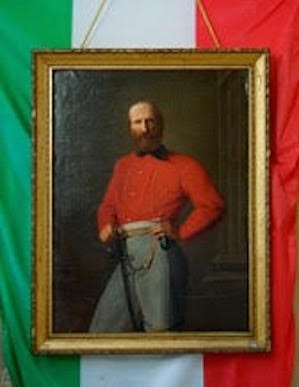 Garibaldi was a general, politician, and nationalist who commanded and fought in numerous military campaigns that eventually led to the fall of fascism and formation of a unified Italy.